Today I'm sharing the second look in my mini style series mentioned in this prior post, which features this darling Anne Klein ruffled-trim bow blouse. In the first look, I styled this blouse with a preppy argyle sweater vest and black jeggings in a dressy-casual look, perfect for dinner or drinks with friends, weekend get-togethers, or business-casual work environments. 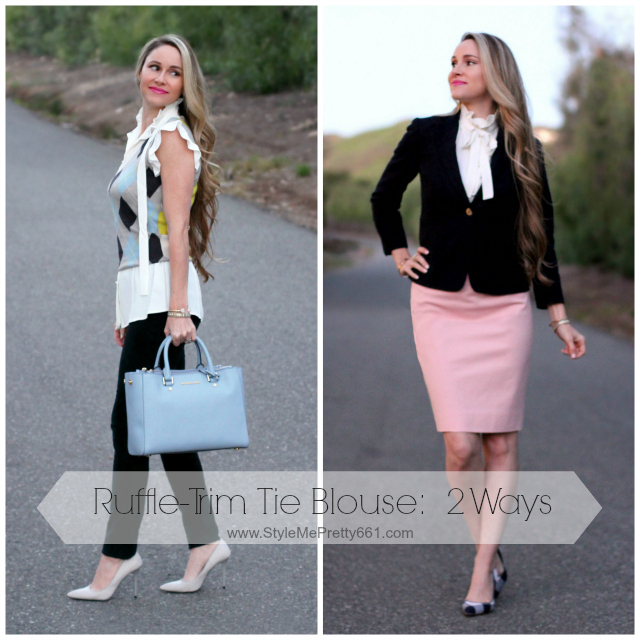 In this second look, I'm styling this blouse in a much more feminine, prim-and-proper look. Here I really wanted to highlight the details of the blouse, pairing it with a streamlined pencil skirt in soft blush, and using contrasting accents of navy and camel in the accessories. Buttoned all the way up and tied, this blouse is oh-so-pretty! It gives the outfit a whole new look, don't you think? It's very feminine and much more "frilly" but I adore it. You can wear it on its own or add a classic-fitting blazer, and you have a simple, ladylike look suitable for the office, brunch with the girls, or even date night. I added a navy blazer for this particular look because pink and navy always complement each other well, and the navy of the blazer ties in with the navy gingham pumps. But, if the blazer is too conservative for your tastes you can easily swap it out with a cardigan or ditch it altogether. This is an outfit I would typically wear to the office or to meetings, corporate luncheons or other events where I want to look polished, pretty, and professional. Depending on the specific event, I might swap out the blush pencil skirt with a more conservative camel or navy one, but blush is always a favorite of mine, so it's definitely on high rotation in both my professional and casual wardrobe. Plus, I just love the way the pink pairs with the pretty ruffles of the top, so that's the one I ultimately decided on for this ultra-femme look. These navy gingham pumps from Ann Taylor are still one of my major shoe crushes; I'm always stopped and asked about them whenever I wear them. Aren't they lovely? I'm hoping Ann Taylor brings them back for those of you ladies who missed out on them the first time, but in the meanwhile, these ones here are a very close dupe (albeit in black) if you've been wanting a similar pair and want to re-create this look. I love that the gingham adds extra interest and flair to an otherwise basic pump; it's fun and unique! To keep the look varied and add another small pop of color, I added my camel Tory Burch bag, which doubles as a clutch. This exact bag is older and no longer available, but I'm loving this one here, here, and here. The camel-brown is a great neutral, and I'm wearing it here to help break up the navy, pink, and ivory colors and keep the outfit interesting. There you have it -- a quick, simple, polished look mixing new (the blouse) and older favorites (skirt, pumps, and blazer) that can be easily adapted for a specific occasion or to suit your personal style. I hope this mini style series, featuring this darling, ruffle-trim tie blouse styled two different ways, inspires you to mix up some of your own wardrobe favorite pieces, old and new alike! Which look is your favorite: the dressy-casual look or the prim-and-proper look? How do you like to re-mix and re-style some of your own wardrobe favorites?